Christopher began writing his insights as a part of his studies many years ago. After sharing these writing with his students, Chris realized that these writings may be of some use to others. Here are a few of Christopher's writings that have been published recently. May they be of benefit to all. As a teacher of meditation I am often asked what benefits a meditation practice can bring to a person. Why should someone take up the practice of meditation? As simple as this question sounds, there really isn’t a pat answer. The benefits and effects of a meditation practice can vary greatly depending on many factors. Perhaps the most helpful way for a beginner to approach this question is for them to ask themselves why they are taking up the practice of meditation. What do they hope to gain or achieve by studying meditation? Some people come to a meditation practice to relax or to bring a sense of calm. Some people for stress relief. For reasons such as these I recommend a lighter meditation schedule. Perhaps fifteen to twenty minutes a day of following the breath and watching the thoughts will suffice. If the student hopes to go deeper into the nature of experience and to perhaps change their relationship to life itself, it usually takes a more committed practice. For this I recommend meditating for at least 35 minutes to an hour at least once a day. Experience of nature becomes more more vivid. Experience ones Self without the constrictions of self definitions. These are just some of the benefits one may experience from a deep commitment to a meditation practice. I would just like to add here that it is very important to come to a meditation practice with a non-judging mind. There is no “good” practice and no “bad” practice. Ideas of “good” and “bad” are conditioned into us and take us away from the present moment. Be patient in the process itself. Meditation is a practice, and just as a musician will not be able to perform Mozart sonatas without hours and hours of practicing scales and technique building exercises, so as it is with meditation. Go at your own pace with a generous helping of self-compassion and a light touch. A good teacher can help a great deal as well. I wish you all well on this pathless path of self-awareness and discovery. Namaste! The above article is based on “Such Sweet Thunder: Healing the Wounds Between Self and Other” Self published by Christopher Luard on Amazon Kindle. Heartfullness was published by Wisdomfeed, March 2019. 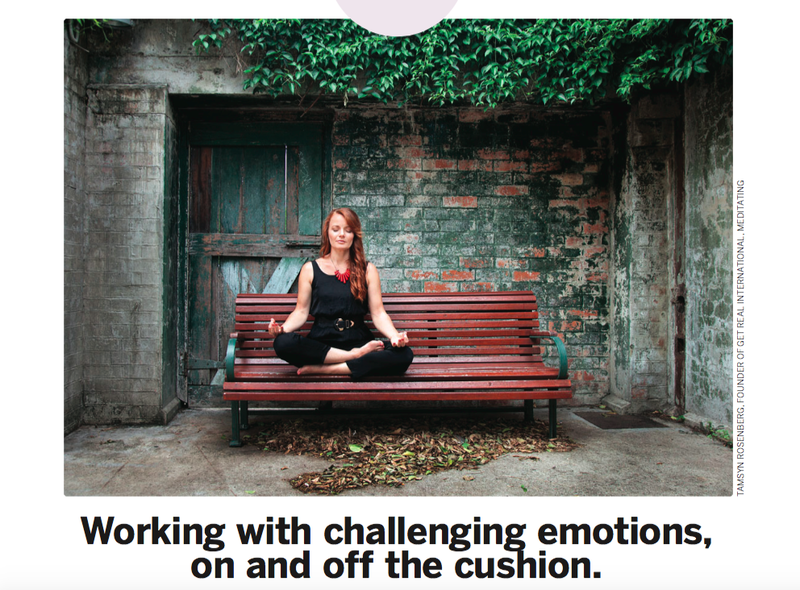 Are you a long-time meditator who still struggles with runaway emotions? Have you never meditated and are curious how to work better with powerful feelings? Here are some powerful and healthy ways to feel and process emotions effectively. To feel emotions is to be human. Emotions need to be felt. In fact, in most cases, if we choose not to feel a certain emotion now, we can be sure that same emotion will be waiting for us later. Typically, if we choose to repress emotions, either it makes us physically ill, or when other experiences trigger a similar emotion, it resonates with the repressed emotion. (Usually both of these are happening simultaneously, more or less.) This resonance makes it impossible to respond to the present stimulus appropriately, and we either fall into a reactive pattern or, at best, overreact with emotions. to the cushion and work on it during a formal meditation session. The second is to bring presence to the body’s sensations during an actual interaction in which a strong emotion is triggered. Do the meditation practice, starting from the beginning. Feel the breath from the nose to the abdomen. Allow your thoughts to settle. Then go through the practice of scanning the body. Feel the body from the top of the head to the bottoms of the feet, allowing the body to rest. Rest right there in the experience of the breath and the body. The body scanning is very important here, as an emotion is nothing more than the body responding to a thought. We often forget this as the body’s response to our thoughts occurs so fast. We feel as though the thoughts and emotions arise together. As our capacity for feeling the body grows, we learn to separate our thoughts from the body’s response to our thoughts. For now, just rest in the experience of the breath and the body. Allow your mind to grow quiet and thoughts to settle. Feel the breath and body as deeply as possible. You may wish to put feeling-attention on the top of your head and the bottoms of your feet at the same time, thus grounding awareness in the body and using the breath as an anchor. Now, while feeling the breath and body in this way, allow the emotion to arise within your awareness. You may use a visualisation for this if you wish. Remember an incident which made you angry within the last month and visualise the incident happening again. Allow the anger to arise within your body. Do not try to talk your way through it. If thoughts arise about the emotion, you are separating from the feeling. You are thinking about the emotion rather than experiencing it. If this happens, use the word ‘thinking’ to clear your awareness of the thoughts, and allow your awareness to be clear, vast, and open. Feel the breath evenly from the nose to the abdomen, the sensations of the body from the top of the head to the bottoms of the feet, and the emotion at the same time. If you find your awareness moves into anger,and you lose the feeling of the breath and the body, you have gone too far to one side. Return to the breath and start again. If you find your awareness moves into the comfort of the breath and the body, and the anger fades away, return to the breath and start again. You may ask questions to direct your awareness, such as, “What does this anger feel like in my body?” or “What happens in my body when I feel anger?” You will know that you have felt the emotion completely and it has been discharged if you can visualise the incident which had been charged with anger and now it holds no charge. You visualise the incident, and you remain calm, still, and silent. When we practise in such a way, we can learn what emotions feel like in the body. In doing this, we can become comfortable with our anger, loneliness, jealousy, or any other challenging emotion. Our emotions no longer threaten us, and so we no longer need to numb out from them, repress them or express them inappropriately. We are free to respond more fully to the present moment. Expression of emotions may indeed be an appropriate response to the present situation, but you will be acting in present-moment action, rather than action that is fuelled and charged by emotions which were encountered in the past but you did not have the capacity to feel fully. When doing this type of meditation, while meditating on an experience in which I have felt lonely – for example, often when feeling the loneliness in my body, other memories have floated up that carry that same feeling.These were memories which had long been forgotten, but the emotional charge was still stored in the body. This is a common occurrence. I recommend picking an emotion that might be particularly challenging for you in life. Spend a month just on that one emotion, and see what happens. After a month, pick another emotion. How do we practise feeling emotions during an interaction? Your boss yells at you at work for no apparent reason, your spouse forgot your anniversary, or your co-worker forgot to put your name in for the long weekend as he said he would. Anger, frustration, and loneliness are just three examples of the very powerful emotions we tend to encounter as our life unfolds. These and other emotions become easier to process in the present moment by doing the meditation practice described above. Your boss yells at you, and you feel the anger in your body. Before doing anything else, feel your breath. Take just a few conscious breaths. Then allow your awareness to expand to include your whole body, from the top of the head to the bottom of the feet. Include the physical sensations of the anger. Oftentimes, memories of being yelled at for no reason will arise at this point. The habit of reaction is strong. Just feel the anger and the body and breath as one experience. Rest there. Remind yourself that you are human, and anger is a human emotion. Many people fight against emotions, thinking that it is wrong to feel a certain way. This typically compounds the emotion further. It isn't wrong to feel anger. It is wrong to punch someone out because you are uncomfortable with how anger feels in your body. It is equally unhealthy to repress the anger. Just feel the anger in the body. Do not try to change the sensations in any way. Using the breath as an anchor, allow awareness to include the sensations of the anger, all the other body sensations, and the sensations of the breath. Eventually, the interaction which caused the emotional reaction will lose its charge and the anger will subside. You will feel a sense of peace at this point, and you will be able to visualise the incident later and remain in a calm, peaceful state. The above article is based on Such Sweet Thunder - healing the wounds between self and other, self-published by Christopher Luard on Amazon Kindle. After witnessing the tragic events of September 11th in NYC, Christopher dedicated his life to the practice and teaching of peace. — -Live, "Take My Anthem"
Well, it is holiday time again. The holiday time is for most, a time for family and friends to gather, perhaps feast, and maybe sing songs of cheer, love, and peace. My personal favorite holiday song is "So this is Christmas" by John Lennon and Yoko Ono. The refrain of the song says "War is over if you want it, war is over now." I'd like to propose this as a mantra for the 21st century. "War is over if you want it. War is over now." Is this possible? Can we see the end of war? Empty battlefields? I believe we can and will see the idea of war come to an end, simply because the survival of the human race depends on it. In reality, war is an idea based on other ideas. A "meta-idea" if you will. So perhaps if we look and see which ideas war is based on, we can see the foolishness behind those ideas, the false need for war will dissipate. The one belief structure which seems to leap out at me is nationalism. Nationalism is what Albert Einstein claimed to be a “cancer of society." Isn't nationalism just the belief that because I was born in a particular culture, religion, belief system, and in a particular government, that the culture, religion, belief system, or government is somehow superior? Just because I was born and raised in America, makes America somehow more correct or superior? Just because I was born a Christian or a Muslim makes whichever I was raised in correct? When it is written down and handed to us in this way, we can probably see the utter madness involved here. We need to be brave enough to see through the false belief of nationalism, which through its very structure creates an "Us verse Them" mentality. In true reality, there is no "Us" or "Them" there is only "We." With that realization, war is indeed over. How many children, husbands, wives and mothers will die this year for the sake of an idea? How many more years will we wage war and conflict on others in support of false beliefs? The second part of the phrase in John Lennon's song gives us the “if you want it.” I have come to see the "if you want it" part more these days. This puts the responsibility of peace right in our lap. It is easy for us to say to ourselves "wouldn't world peace be great" or "If only the politicians would stop waging war, we could live in peace" or "how can we ever achieve peace when so much violence continues unabated around the world" Indeed, its easy to raise our arms in hopeless desperation and just give up. But it is just that hopelessness that allows the violence to continue. Whenever you feel like giving up, bring awareness to what that feels like. What does this hopelessness feel like in my mind? What does this desperation feel like in my body? Is there a tightness in my abdomen? Is there tension in the back of my neck? Does this hopelessness have a particular color or shape in my mind? In my body? Do not try to answer these questions, but allow the questions to bring you to a more intimate relationship with this hopeless desperation which keeps war and violence alive and peace at bay. Peace happens one person at a time. We can easily look out on our present world day situation and get frustrated, angry, or upset. We can condemn or curse those whom trespass against us. But it is just that hopelessness, that frustration, that condemnation which ads energy to the violence. It multiplies violence into more violence. The energy we use to get upset, frustrated or angry breeds more violence...either overtly or covertly. We could use that energy for better means. Take time every day. It could be just a few minutes...but take time every day to find stillness. You don't have to go to a mountaintop or into the woods to find it. If there is sound there is also the backdrop of silence. It is the silence which allows the sound to be there. Can you hear the silence underneath the sounds which you now hear? This canvass of silence upon which the universe orchestrates the soundtrack of our life. Take a few moments to rest with that silence. Look around you now. Perhaps you see objects in the room around you, maybe the computer in front of you as you read this. But none of this experience would be possible without the space in which all these objects arise. Pay close attention to that space. The emptiness side of experience which is always with us, but we fail to recognize, being so hypnotized by the forms which arise in this space. It is in this space where peace is found. It is in this stillness that the phrase "War is Over" begins to make sense. I have stopped adding anger, aggression, violence to my world. I have made a choice. For me..in my worldview...war is indeed over, despite the violence that rages on across the globe. I am not ignorant to the situation and I don't turn a blind eye to it. War ends one person at a time. Do you want it? And as John Lennon said “You may say, I'm a dreamer....but I'm not the only one. I hope someday you will join us. And the world can live as one." There is a story in the Buddhist canon which tells us of a person rowing a boat across a very large lake. It is just before sunrise and there is a heavy fog. A fog so thick that the rower cannot see past the bow of his own row boat. Suddenly there is a SLAM and he has run into another boat head on. Our boatman is furious and begins yelling and screaming obscenities at the other boat. As he rows alongside, his angers dissipates as he realizes the boat he has run into is abandoned. There is no one there to get angry at, and thus…his anger subsides. Perhaps if we can see terrorists and terror attacks as the empty boat, it might take some of the fear and anger out of terrorism, thus making the terrorists primary weapon useless. Just as it was the nature of the abandoned boat to simply drift in a random direction, unable to steer itself out of harm's way, so it is the nature of terrorists to commit heinous acts of violence against innocent people. I drew this parallel this year watching hurricane Irma strike the USA on September 11th, 2017. The same day as the World Trade Center and Pentagon attacks sixteen years later. We seem to be able to witness the storm, prepare for the storm, flee the storm,, and rebuild from the storm without the deep seated horror and fear that a terror attack tends to bring. Why? Because there is no ego driving the storm. Irma, the storm is the empty boat. It is the nature of the storm to do exactly what it is doing. There are many lessons to be learned from natural disasters such as Irma and Harvey. Compassion, loving-kindness, a deeper care and respect for our environment, and solidarity regardless of race, creed, sexual preference to name a few. Perhaps we can also learn to see our fellow human brothers and sisters as boats. The empty vessels which we bump into from time to time on the large lake of life. Perhaps we may then cease our habitual reactions of anger, fear, and aggression. People can only behave to the highest level of their evolution. People can only serve the truth within themselves to the best that they have been taught how to. Just as an empty vessel can never steer out of harm's way. It is just its nature. Just so. Those of us living in America in the current political climate have been given a rare gift. At this time we are faced with the unique opportunity to come together through compassion, empathy, and understanding. This can only happen however if we say a resounding, powerful “NO” to either the current administration or those who protest the current administration, and do so without allowing that “NO” to enhance, strengthen, add to, build, or somehow reinforce our sense of “I”. This can be quite challenging to do. Our sense of “I” thrives off of and feeds itself on the sense of “other”. Our “I” loves the “other” because it is quite dependent on the opposing “other” for its very existence. If we say no or oppose the injustice being forced onto the world through the current White House administration, we may indeed win…but victory will be short lived. Soon an equal and opposite reaction will arise. Just like it has now. No. We must allow the sense of “I am right” and “you are wrong” to dissolve. If we can say “No” from that place, then peace will prevail in the heart of humanity. How do we say “NO” to this type of insanity without feeling a sense of opposition? Without a sense of right and wrong, good or bad, up or down? Try this: the next time you are watching the news, (social media, radio, however you take in the current events) and you hear or see something you feel to be against the grain of humanity, human rights, human freedoms, etc.. feel what that feels like. Imagine yourself speaking out or protesting against the policy, executive order, bill, or law. Ask yourself “What does this feel like in my body when I protest?” or ‘What does speaking out like this feel like in my mind?” “Is there a unique sensation?” “Is there a color associated with the feelings of saying this resounding “NO!”? These questions are not meant to be answered, but rather, to bring your attention to what it feels like to say “NO!” When you do this, you are looking at the feeling of saying “NO” rather than being the feeling of saying “NO!” Thus, the feelings of protest does not reinforce the ego, because you are looking at the the feelings and protesting from a sense of spacious awareness, (the witness of your body sensations in protest AND the situation) rather than looking at the world through the feelings of protest. By looking squarely AT the feelings of protest, you make those feelings into an object which you, the subject, can witness. When you do this type of practice stories may arise in the mind. Stories like “I don’t see how they can do this…this is so unfair…how can this world be so unjust…etc.” These stories only act to reinforce the ego. The sense of being “Right” and making others “Wrong”. If these types of thoughts arise while looking at the feeling of protest in your mind, heart, and body, then simply let the thoughts go and bring your awareness back to the feelings. No anger arises in this type of protest. The anger isn’t needed. No justification or defensiveness arises in this type of protest, because we speak from a deeper truth. A truth which needs no defense. If we continue to protest through the structure of the ego, our feelings of resentment, anger, and fear will shade, color, and infuse the world we live in. Our ego thus becomes stronger, and the very force we are fighting against now has the fuel it needs to fight back. If this happens, we will continue to oscillate back and forth between liberalism and conservatism until we destroy ourselves. Through Love, Empathy, Compassion, Equanimity, and Joy we can overcome. Today is a great day for freedom. I hope you will join me. The post Saying NO With Mindfulness in the Trump Era appeared first on WisdomFeed. The year was 2003. I was living in Brooklyn, New York at the time, and I had been studying Zen for several years. In addition to my Zen studies, I had recently taken up Vedanta Hinduism and practice kundalini yoga. I was spending about four to five hours a day immersed in various spiritual practices. I was mixing and matching the philosophies and practices, chants and silent meditations, yoga asanas and walking meditations. I loved all of it. I could feel myself generating a kind of radiant light that accompanies the unspoken knowing that comes with profound spiritual practice. People and situations were drawn to me and life seemed to effortlessly unfold before me. This did not mean painful occurrences and challenges did not present themselves at all at this time. They did. However, I was always able to see those situations as opportunities for growth, and they too became a part of the path. Fast-forward to 2004. It was a warm, September evening in Brooklyn. The hum of the AC was accompanying my meditation as were the soft chirps of crickets. I had finished my daily routine of two hours of Shikan-taza (sitting zen) with a break in the middle for walking meditation, 90 minutes of kundalini yoga, an hour of chanting from the vedanta tradition, and was nearing the completion of my chakra visualization practice when it happened. Suddenly and without warning, within my line of sight but with my eyes closed, my entire life arose. Not in any time line or in any particular sequence, but just random scenes from my life. And when I say entire I mean EVERYTHING. From birth to present. The experience unfolded much like the bardo realm from The Tibetan Book of The Dead, in that at first, all the memories were very pleasant. Blissful, happy times filled with laughter. There was pleasant, peaceful, almost aquatic sensation of oneness. I was playing with my brother as an infant. (There is no time frame for the early memories, as the events took place before I could tell time) the first time looking into my fathers eyes, playing stickball with my brother in NY and family BBQ’s in the backyard, sailing as a child with my brother and father. What was so shocking about this experience (all of this is happening while I am meditating) wasn’t so much the memories themselves but the absolute vividness and the overwhelming emotions that flooded my entire being with bliss, joy ripping through each fiber of my being. I wanted more. I grasped for the memories, reached for them, desired them. And by doing that, they disappeared. I had failed to realize that these memories were already me. There was no memory experience outside of myself. So, nothing to desire. But in reaching for the experience I pushed it away. In replace of the joyful, blissful memories came the painful, hateful memories. The birthing process itself was painful. Wrought with sadness and despair as my mother was rushed to ICU after giving birth. Confusion. I remember the nurse who held me. I remember her blue eyes and blond hair. I remember she smiled nervously as she held me. My first surrogate mother. I remember the heat lamps they put me under in the hospital. I remember the “near death” experience at 18 months old, the Dr.s hands as they wrapped me in ice and the stickyness of the heart rate monitor adhesives. The also remembered the abuse that put me there. There were so much more of the painful memories as I had build up a wall around these as a defense so I would never have to experience the pain. (That wall had crumbled now as a result of the meditation.) Gut wrenching emotional anguish tore through me like fire raging through a gasoline drenched warehouse. I eventually began to push away from these memories. I didn’t want to see any more or know any more. It was too much already. And with that, the memories started to fade. It was the same process as the blissful, heartwarming memories. They were all inside of me. In essence.. they are me…and I am them. But in pushing away I created a dualism. The memories were there, and I was here, pushing against them. The visualizations began to settle at last. I could feel the sweat soaking through my clothes and dripping down my face. I could hear the AC and the crickets again. I was returning to my everyday reality. I opened my eyes and looked down at my meditation timer. I had experienced my entire life in exactly seven minutes. I shook with both ecstatic delight and gut wrenching despair at the same time, tears and laughter pouring out of my soul. I immediately called my Vedanta teacher Dada, and asked him for advise. He told me I should just keep practicing, that this would pass. He sounded pleased. So I put the phone down and returned to my sweat stained cushion. I lasted maybe five minutes before began to shake. In less than ten minutes I was running to the toilet to vomit. More meditation was clearly not going to be an option. I called the Zen center and described to the monk who answered what I had just experienced. She told me to stop meditating and that it was too much. Something would break. I believed her. It certainly FELT like something was close to breaking. I left the apartment and went for a walk. The humid September air brushing against my skin, cooling my still damp from sweat body. My heart rate returned to normal within a half hour. By the time my ex had returned home from work, I felt sane again, albeit quite shaken. I learned some six months later that this experience is not that uncommon with Kundalini students. Writer Ken Wilber calls this a “Kundalini Break”. (This seems to happen frequently in kundalini yoga—the yogi pushes it too hard and is inundated by his own Archetypal energies. The Atman Project p 118) It is an amazing and extraordinarily powerful experience. I was not ready for this at the time and was very lucky to have good advise a phone call away. I continued studying both Zen and Vedanta for a few more years, mostly working on deepening my understanding of that peak experience and sorting out what to do with all of it. I still practice Zen and Kundalini but combine it with meditations from the Kagyu Buddhist tradition. And when things get too hot, I always stop. The greatest lesson I learned from this experience (other than the ones contained in the memories themselves) was that if you are going to take up a spiritual practice, find good, qualified teachers who have the time and energy to dedicate to teaching you about the path you are on, and who have walked the path themselves. There are too many yoga teachers who have never attended a meditation retreat or taken a proper meditation lesson teaching ten minute meditations at the end of a yoga session. (It would be better to call this time ”subtle energy relaxation time”) Relaxing, yet hardly insightful. At the same time, there are videos like P90x (great workout, by the way) which have a yoga chapter, and if you have never been to a yoga class, you could really hurt yourself, or at best, never really feel the benefits of true yoga. I cannot recommend the combination of yoga and meditation highly enough. You do not have to have four or five hours a day to practice to combine disciplines. That schedule was right for me at that time in my life. However, If you have an hour of practice time, spend thirty minutes on each discipline. I promise you both your yoga and meditation will grow exponentially. Faster and stronger than doing an 50 minutes on one and 10 minutes on the other. It is all about balance and union, after all.